Besides the gun, it would be hard to take someone like that serious. There was some awkward silence and staring at the end.. I thought something big was going to go down. At the very least I was hoping the robber was going to blast a hole in his junk when he haphazardly was putting the gun back in his pants. I heard on a local radio station that he actually does not have any kids. He was the pellet gun robber many years ago and was caught. If i remember correctly he was let out 6 months ago. Foggy on the details. Well, further research reveals he was using a air gun and his story about having kids to feed is a total fabrication. This guy is a career criminal and not a very good one. What a lying idiot, he tells people that to feel better about being a worthless scum? Well, at least he was professional about it. I mean, think of the way it’s usually handled by low life robbers who pop a cap in the victim after they have completely co-operated. Yes, if the suspect got shot during the holdup, that’s fair game, but I’m just saying, it’s refreshing to see someone who at least doesn’t shoot the victim after the robbery. 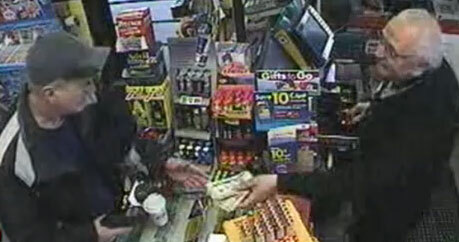 Of course, it’s just a pellet gun, I’m just saying that if you’re going to be a robber, at least be professional.